Main purpose of this report is to Credit Worthiness Analysis on Mercantile Bank Limited. Other objectives are analysis on credit management activities specially- credit policy and practices, credit appraisal, credit-processing steps, credit management, financing in various sector and recovery, loan classification method and practices of Mercantile Bank. Finally identify and suggest scopes of improvement in credit management of MBL. Study or working on any subject must have objective. It may be only one objective or a combination of some objectives. My study also have objective. Before submitting the report I need to discuss briefly my Main Objective and related Specific Objectives. The basic objective of this paper is to be acquainted with how a banking financial institution evaluate individual potential borrower – based on which sanction different of credit limit to different customer and charges different interest rate to different borrower. That is what factors determine these decisions. To analysis- the pros and cons of the conventional ideas about credit operation of a Bank. To have better orientation on credit management activities specially- credit policy and practices, credit appraisal, credit-processing steps, credit management, financing in various sector and recovery, loan classification method and practices of MERCANTILE Bank Limited (MBL). To have an adequate knowledge about which factors mostly affects the loan sanctioning decisions, what amount of loan should be sanctioned to a particular loan applicant depending on his credit worthiness. To compare the existing credit policy of MBL with that of best practices guideline given by Bangladesh Bank, the central bank of Bangladesh. To identify and suggest scopes of improvement in credit management of MBL. To get an overall idea about the performance of MERCANTILE Bank Ltd.
To fulfill the requirement of the internship program under BBA program. Besides these Oral & informal interview with officers and employees of the MBL and also Face to face meeting with the Company personnel and Face to face meeting with the different people. Secondary Sources: The secondary data have been collected from different publications of different Private Banks in Bangladesh, publications of Private Banks, publications of MBL and related Magazines and Websites. Mercantile Bank Limited was incorporated in Bangladesh as a banking company under the Company Act 1994 and commenced operation on 2nd June 1999. Numerically it is just another commercial bank, one of many now operating in Bangladesh, but the founders are committed to make it a little more different and a bit special qualitatively. This bank will have a new vision to fulfill and a new goal to achieve. It will try to reach new heights for realizing its dream. 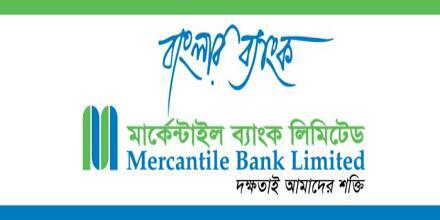 Mercantile Bank Limited, “A Bank for the 21st Century”, it is not a mere slogan. The Bank has been manned with talented and brilliant personnel, equipped with modern technology so as to make it most efficient to meet the challenges of 21st centuries. As regard the second slogan of the bank “Efficiency Is Our Strength” is not a mere pronouncement but a part of their belief, which will inspire and guide them in there long and arduous journey ahead. Now the slogan is “Banglar Bank”. The declaration of the Government’s bold and far sighted decision to allow banks in the private sectors to play its due role in the economy of Bangladesh, have started the process of creating new and dynamic financial institutions. MBL is one such institution. The emergence of MBL in the private sector is an important event in the banking arena of Bangladesh. MBL came into existence as a Public Limited Co. incorporated in Bangladesh on May 20, 1999 with the primary objective to carry on all kind of banking business in and outside Bangladesh and to give effect to the bank of credit and commerce international limited scheme, 1999. Framed by the Bangladesh Bank with a view to safeguard the interest of the depositors. MBL commenced its business from June 20,1999 with authorized capital 80 crore and paid up capital 24.5 crore. Famous 30 entrepreneurs gave helping hand to set up the bank at that time. Then Abdul Jalil was elected as chairman of the Board of directors. The bank stood 42 branches all over the country up to 31st December, 2008. From the quantitative analysis it is found that the average rating of MBL is 1.7 which is between 1.5 to 2.4. According to standard rating the rating of those banking institution having this range is 2, ie, the rating is satisfactory. The importance of the mobilization of savings for the economic development of our country can hardly be over emphasized. The bank considers savings and deposits as lifeblood of the bank. More the deposit greater is the strength of the bank. So they intend to launch various new savings schemes with prospect of return duly supported by a well-orchestrated system of customer services. Technologies such as computer, ATM, telecommunication etc. all would be harmonized and adapted to the system in order to provide found the clock and any branch services to the clients. It is the most important side for a bank. Bank is nothing but a middleman between lenders (surplus sector) and borrowers (deficit sector). To provide loan, bank needs a huge amount of money from the lenders. General banking is the side where bank offers different options to the clients to deposit (save) and remit their money. To invite the clients, bank offers different options in front to their clients. Most of these options are very much similar between the banks, but the customer services and facilities may not be the same. Usually a person needs to open an account with the bank to take services from it. Without opening an account, one can get a few services from the bank. So we can say that banking begins with the opening of an account with a bank. Generally, there are three types of accounts in our country’s banking system. Current account is purely a demand deposit account because the bankers are bound to pay the amount to the account holder on demand at any time. It is a running and active account which may be operated upon any number of times during a working day. There is no restriction to the number and the amount of withdrawals from a current account. This is an account for a student, an employee, a widow and an organization that is not working for profit. It pays interest to the client and the service charge of this account is less than the CD Account. A deposit that is received for a specific period of time, paid with interest after the period is over, is called fixed deposit. It is also called Term Deposit. Telegraphic Transfer, it may branch Telephonic or TELEX Transfer means fund/money transfer from one branch to another branch not in same area. Sometimes the remitter of the funds requires the money to be available to the payee immediately. In that case the banker is requested by him to remit the funds telegraphically. The bank passes T.T by a secret code, which input by the GB in-charge & branch Manager. Remittance refers to sending of money that is the process of sending money from one place to another is called remittance. Banks remit funds one place to another through the network of their branches. The main instrument for remittance of funds is drafts, mail transfer, telephone transfer and traveler’s cheques. A bank draft is an unconditional order issued by one branch of a bank on its branch to pay a certain sum of money to the named person or order of demand. Pay Order gives the payee the right to claim payment from the issuing bank. It can be encashed from issuing bank only. Unlike check, there is no possibility of dishonoring pay order because before issuing Pay Order, bank takes out the money of the pay order in advance. Pay Order cannot be endorsed or crossed and so it is not negotiable instrument. Funded Part (Providing Cash Amount to the Creditor). Non-Funded Part (No Cash Amount Involve). Time loan (not more than one year). Term loan (more than one year). There is no cash amount involved in this kind of loan. BLC (Bill for L/C) and bank guarantee falls in this kind of loan. In case of BLC foreign exchange department mainly deals with it. Letter of Credit (For Export and Import). In case of any foreign trade there must be a L/C procedure. As we know, there is no guaranteed relationship between importer and exporter. As a result, they use a media to secure their goods and currency. So, exporter and importer use their respective bank as a media and L/C is a legal obligation between exporter and importer. In case of import the importer have to submit necessary documents to his respective bank (the issuing bank). MBL is an authorized dealer of American Express T/C. At the same time, they can buy and sell T/C and dollar every morning they get a telex from head office, which carries the rate of foreign currency of that day. MBL do not fix the rate by them, they use the rate of Janata Bank. At the end of each month, they submit all supportive documents and transaction condition of the whole months and balance to Bangladesh Bank and their head office. Foreign DD and paying or receiving any bill from foreign country is known as foreign remittance. The amount of foreign remittance is very significant in MBL. A foreigner a wage earner working in foreign country can open this account. MBL mainly maintain Dollar account, but it is possible to open an account in other recognize foreign currency (British pound, Deutsche Mark, Franc etc.). The account holder gets a cheque book against the account and has to mention the amount m respective currency. A credit policy includes all rules relating to loans and advances made by the bank to the borrowers. It includes types of credit extended by banks, method of judging the credit worthiness of borrowers, the collateral or securities that are accepted by the banks and so on. This policy guidelines refer to all credit facilities extended to customers including placement of funds on the inter bank market or other transactions with financial institutions. MBL Credit policy contains the views of total macro-economic development of the country as a whole by way of providing financial support to the Trade, Commerce and Industry. Throughout its credit operation MBL goes to every possible corner corners of the society. They are financing large and medium scale business house and industry. At the same time, they also takes care entrepreneur through its operation of Lease Finance and some Micro Credit, Small Loan Scheme etc. As a part of its Credit Policy MBL through its credit operation maintains commitment for social welfare. The bank is coming up with a scheme where the under privileged children will be given financial support for education and self-employment. MBL puts emphasis on the customers, i.e., the man and business not on the security in selecting borrowers. Lending of money to different kinds of borrowers is one of the most important functions of Mercantile Bank Limited (MBL). Major amount of income of this Bank comes from its lending. MBL makes advances to different sectors for different purposes, such as financing in trade and commerce, imports and exports, industries, transport, house building, agriculture etc. Loan disbursement system: One time. When the principal debtor fails to fulfill this obligation or promise, liability bestow on guarantor. Cash credit is another method of lending by MBL. Under this system, the banker specifies a limit called the cash credit limit, for each customer is permitted to borrow against the security of tangible assets or guarantees. Cash credit in its truest sense is against pledge of goods. Cash credit is sometimes allowed against hypothecation of goods. Eligibility: Hypothecation advances are normally allowed by bank to limited companies and businessmen for their working capital and not for any capital investment. Interest Rate: 15%-16% which depends on the relationship between the banker and the client. Renew System: It can be renewed after one year. Insurance policy to be obtained against the stocks to be hypothecated to cover in fire and RSD at the cost of the customer. Stock report to be submitted on monthly basis. Bank reserve the right to cancel or call back the sanctioned credit limit. Another form of consumer credit is house building loan. The main objectives of the bank is to provide financial assistance for the construction, repair and remodeling of residential houses. Loan is also allowed to buy apartment. The feature of this loan is that the customer get 50% loan of the land value. Usually a deposit has to be paid the customer and the rest of the purchase price is spread over in a period of six months, two years or sometimes even longer; the article being regarded as the property of the bank until the final payment has been made. Eligibility: This loan is allowed for the business person and service holder. Packing credit is essentially a short-term advance granted by MBL a to an exporter for assisting him to buy process, pack and ship the goods. The credit is generally extended for payment of freight, handling charge, insurance and export duties. The packing credit advances docs not normally extend 180 days and has to be liquidated by negotiation/purchase of the export bill covering the particular shipment for which the packing credit was granted. Eligibility: Packing credit facility has given for small-scale indigenous manufactures or exporters. Disbursement will be made be made after completion of all formalities as per sanction terms. The amount of advance against packing credit will be adjusted from the amount payable to exporter on negotiation or purchase of bill. The exporter’s letter of credit should be irrevocable, constricted and valid and confirming bank must mark lien on it. MBL has given the facility of LTR under this arrangement, credit is allowed against trust receipt and the exportable goods remain in the custody of the exporter but he is required to execute a stamped export trust receipt in favor of the bank. Where in declaration is made that he holds goods purchased with financial assistance of bank in trust for the bank. Eligibility: Loan against trust receipt is generally granted to Exporter for exportation of good. Interest Rate: 15.5%-16% which depends on relation and frequency of taking loan. Supplier credit report to be obtained before opening of L/Cs. A loan facility provided by the banks to the customers against document/bills, like, Bill of Lading, Warehouse keepers Certificate/receipts, Railway receipt. Delivery order, Dock Warrant. In other word, payment made by the Bank against lodgment of shipping documents of goods important through L/C falls under this head. It is an interim advance connected with import and is generally liquidated shortly against payments usually made by the party for retirement of the documents for release of imported goods from the customer’s authority. If falls under the category “Commercial Lending”. Eligibility: This type of credit facilities is given generally Exporter and importer. It is a continuous advance facility. By this agreement, the banker allows his customer to overdraft his current account up to his credit limits sanctioned by the bank. The interest is charged on the amount, which he withdraws, not on the sanctioned amount. When a current account holder is permitted by the banker to draw more than what stands to his credit, such an advance is called an overdraft. The banker may take some collateral security or may grant such advance on the personal security of the borrower. MBL has given this overdraft facility to clients. Eligibility: Overdraft facilities arc generally granted to businessmen for expansion of their business, against the securities of FOR, MSP, MUDS, DBDS, SSS, against earnest money, work orders and general/others. When deposited by a customer is not repayable on demand and is payable only after the expiry of a specified period from the date of deposit or after a specified period of notice. It is also known as “Monthly Saving Scheme”. The prime objective of this scheme is to encourage people to build up a habit of saving. Under this scheme, one can save a fixed amount of money every month and gel a lucrative amount of money after five, eight or ten years. Under this scheme, one can deposit certain amount of money for five or more years and in return he will receive benefits on monthly basis. Benefits start right from the first month of opening an account under the scheme and continue up to five or more years. Under this scheme, depositor’s money will be doubled in 08-year period and the scheme is one of the highest yielding deposit schemes in Bangladesh. Under this scheme, depositor’s money will be tripled in 11-year period. The main attraction of the scheme is that one can get his money after one year and onward with attractive benefits. Contractors have to participant in tender for being awarded of the work. For getting better probability, contractors usually participate in various names in the tender. Bank makes finance to the participating contractors for acquiring the works. If a contractors wish to participate in 10(ten) works. Bank receives the value of 1 (one) earnest money and finance the rest 9(nine) earnest money. Bank also keeps certain percentage of margin for adjustment of the interest amount no collateral security is required for this finance. This loan is specialized for contractor and suppliers. Bank makes finance to the customers after being awarded of a work order. The work order is assigned with the bank so that payment of bill is paid only through the account marinating with the lending bank. Maximum 20% value of the work order is paid to the contractor as loan. The loan amount is credited to the account of the borrower and from each bill certain percentage is debited for adjustment of the loan. Maximum validity period of the credit facility is up to the validity period of the work order. Car loan is a kind of consumer credit scheme. But the maximum limit on this specified type is different from others. The maximum limit is higher than other types of consumer credit scheme. Eligibility: This is one kind of consumer credit scheme. So the qualification should be the same as required for consumer credit scheme. Mercantile bank Limited provides advances to the staff for purchasing house building, Sanchay Patras, and meeting up certain requirements like family medical, personal medical, wedding purposes. Bank provides this facility under installments. Loan able amount varies on the basis of purpose. Eligibility: The borrower must be executive and staff of this Bank. Another form of consumer credit is Hire Purchase facility also given by MBL. The feature of hire purchase is that usually a deposit has to be paid and the rest of the purchase price is spread over a period of six month, two years or sometimes even longer, the article being regarded as the property of the bank until the final payment has been made. Eligibility: Hire Purchase is normally allowed to those persons who have either fixed sources of income or who desire to pay it in lump sum. This scheme has been designed to assist and encourage the genuine and capable entrepreneurs and professionals for acquiring capital machineries, medical equipments, computers and other items which may help them to be economically self-reliance. Eligibility: Help the entrepreneurs to buy Capital Machinery, Medical Equipment, Automobiles, Lift and Generator etc. MBL provides different types of micro-credit programs among the poor/mid-class/lower mid-class categories person. Mainly the bank provides micro-credit loan among the minimum a fixed income group of people. Consumer Credit is a relatively new field of collateral-free finance of Bank. People with limited income can avail of this credit facility to buy households goods including car, computer and other consumer durable. The main objectives of this scheme are to help the lower mid-class people for purchase different types of household equipment’s. And also help to the mid-class people for buy car/microbus for personal use. This scheme has been evolved especially for small shopkeepers who need credit facility for their business and cannot provide tangible securities. Maximum loan amount of this program is to TK. 2 lac, which is payable within 2 years (extensional). Creditors have to pay 15% interest, Risk Fee 0.5% and Supervision fee 1% (for one time). Eligibility: Small and Medium Entrepreneur are financed this loan. Personal loan is another method of lending by MBL. Under this system, the banker specifies a limit called the credit limit, for each customer, up to which the customer is permitted to borrow against the security of tangible assets of guarantees. Consumer credit is a relatively new field of micro-credit activities; people with limited income can avail of this credit facility to buy any household effects including car, computer and other commercial durable. Mercantile Bank Limited plays a vital role in extending the consumer credit. Creditor will procure the specified goods from the dealer / agent / shop(s) acceptable to the bank. All the papers/ cash memos etc. related to the procurement of the goods will be in the name of the ensuring ownership of the goods. The ownership shall be transferred in the name of the client after full adjustment of bank’s dyes. The client shall have to bear all the expenses of license, registration and insurance etc. of the articles wherever necessary. The client shall have to bear all the cost of repair and maintenance of the acquired articles. Eligibility: Only the doctors are financed through this scheme. Eligibility: Letter of Credit facilities are given to exporter/manufacturer/producer and importer for exportation and importation of good. It should stipulate the name of the loan. Items mentioned in LCA form must contain with the permissible items. The bank officer periodically inspect the goods and verify that they conform the top quality and quantity as mentioned in the particular letter of credit. In case of first class customer , the facility may, however , be granted against firm’s contracts with overseas buyer. “A contract of guarantee is a contract to perform the promise or discharge the liability of a third person in case of his default”. Eligibility: This loan is allowed for the business person. To lend money is an easy matter. To be sure of recovery of the loan is not that easy. In whatever form bank advances are granted, they are repayable on demand or at the expiry of some fixed period. Overdraft and cash credit are legally repayable on demand. Loans are repayable on the expiry of the periods for which they are granted. In case loan is repayable in installments and default occurs in the payment of any installment, entire loan usually becomes immediately recoverable at the option of the bank. Letter against trust receipt, payments against documents, letter of credit are payable on maturity. Banker has to keep a close watch on the borrower and to take adequate follow-up measures for ensuring that recovery of advances is smooth and timely. The management of the institution as well as their supervising authority i.e. the Central Bank evaluates the assets of the institution keeping in view the aforesaid aspects. This evaluation at stipulated intervals is called “Classification of Advances”. It is in fact, placing all loans and advances under pre-determined different heads/classes based on the depth of risk each and every loan has been exposed to and to bring discipline in financial sector so far risk elements concerned in credit portfolio of banks. 1.Substandard: A loan value of which is impaired by evidence that the borrower is unable to repay but where there is a reasonable prospect that the loan’s condition can be improved is considered as substandard. The Banking sector in any country plays an important role in economic activities. Bangladesh is no exception of that. As because it’s financial development and economic development are closely related. That is why the private commercial banks are playing significant role in this regard. This report focused on and analyzed Operational Performance of Mercantile Bank Limited, Green Road Branch. Mercantile Bank Limited is a new bank in Bangladesh but its contribution in socio-economic prospect of Bangladesh has the greater significance. Total deposit of MBL Branch was Tk. 24959.5 million as on 31st December 2005, whereas total Loans and Advances were Tk 21857.7 million . Here we observe its deposit figure is not so strong, so the bank should take necessary action for increasing deposit promptly. MBL attaining offer special deposit scheme with higher benefits, which is a crying need for long-term position in financial market. Because of the entrance of more banks in the financial market, deposits will be spreaded over. So it is high time to hold some permanent customers by offering special deposit scheme otherwise in future amount of deposit may come down. To strengthen the future prospect of branch, it is emergency to collect more deposit. Comparably the MBL’s local remittance is less than the other banks because of less number of branches. MBL should extend its branches to become a sustainable financial institution in this country. Yet last year MBL has obtained second position in CAMEL rating. As a new branch Green Road Branch of MBL has been able to maintain its recovery position in sector-wise credit financing is up to the satisfactory level. At last it should give more emphasis in this sector to acquire more profit. In the frequency table, it is found that most of the clients are in category seven where the no of frequency is 31 out of sample size 50 and interest rate is 15.5%.This implies that most of the customers of our sample are taking the loan which charges 15.5% interest rate. In the above table, it is found that most of customers fall in category 1 that is they have net asset ranging from tk.100000 to tk. 300000 and no customer belong in category 5 and 6.It is observed that category 1 customer takes consumer credit scheme, personal loan scheme that is they normally avail small amount of loan as have small amount of net asset. Here, different loan purpose has been given different score and thereafter have been categorized. In the above table it can be observed that most of the customer falls in category 3 and 5. Here the frequency of both categories is same which is 12. The above frequency table is based on age category. Here, the sample size has been categorized based on age differences of the client. That is in what aged people take the loan most from the bank. Here we can see that category 2 aged people take the loan most that fall in the age range of 29 years to 31 years. The next most frequent category is 3 and then 2. From the table it is obvious that most of the customers of our sample fall in category 1 the frequency of which is 21. The range of income of this category is from tk.5000 to tk. 15000.This implies that middle income level customer most frequent in our sample. The next most frequent category is 2 which indicate the income level from tk.15000 to tk.25000. The above table is based on the no of years of experience in job. Here, we can see that in category 2 most of the customer belong which is 14 and the range of this category is 5 to 10 years. Like the loan purpose, personal guaranty has also been given score based on judgment for the analysis purpose as it is a qualitative factor affecting our decision. Based on the score, they have been categorized. Here, the most frequent category is 7.there is no customer who belongs in category 5. Through Correlation Analysis, interest rate has significant relationship with loan purpose whereas credit rationing has with income level .The Regression Analysis indicates that the factors that MBL considers in determining interest rate and credit rationing are not sufficient Because the factors that have been used as input variables in interest rate determination can explain only 28.3 % variance in interest rate and in case of credit rationing only 27.3 % is explained through these variables. Again by the F-value it is obvious that the contribution of these variables is not highly significant. But the adoption of regression analysis along with other reform measures, for example, Lending Risk Analysis (LRA) in the banking sector, the concept of lending can be changed. Nowadays, it is production and purpose oriented not security oriented. Today, more emphasis is given on the background of the customers, soundness and viability of business, cash flow of the business etc. But I think sometimes security is needed for the protection of any adverse situation. In my study it is also found that bankers and executives of MBL as well as others don’t use any statistical tools in their lending decision. But in my opinion, it is important for the entire bank to use some statistical tools, eg. regression analysis to assess which factor is mostly important that the bank should consider along with LRA. Again the existing LRA form have been designed only for manufacturing concerns but in reality there are other concerns exist as well. That’s why besides LRA some other tools should also be used in lending decision and before sanctioning any credit limit. Credit Worthiness Analysis helps to assess whether the potential borrower will be able to repay the loan that is the risk of failure to repay loan. The findings of the empirical study might serve the interests of a number of parties. The Bank can get effective feedback regarding their promotional performance. This study will help the MBL to have a thorough assessment about the financial quality of the before sanctioning any credit and ensure repayments. This study will make the bank more careful in lending activities and it will help the Bank in the long run. This study will also help MBL to grow efficiently in this competitive business world. This research will help the planners, executives and practitioners in understanding about Regression analysis and the recommendations will help for future application of statistical tools in banking sector. The other Bank’s can redesign their banking policy according to the requirement of the Bank’s need. The findings of this study will also provide more valuable information to the teachers and academicians, who can find the study useful in designing academic curriculum, preparing and delivering class lectures, designing course outline etc. The students can also use the findings for their academic purpose. Mainly, my topic was credit worthiness analysis but I have also focused and analyzed on Operational Performance of Mercantile Bank Limited Green Road Branch. MBL is a new bank in Bangladesh but its contribution in socio-economic aspect of Bangladesh has greater significance. Though my topic is connected on the overall banking divisions or sectors, I have tried to identify the process of disbursement of loan, performance and problems of the bank as a whole. I have found a fewer number of factors, which impede the achievement of ultimate goals of MBL. It is not easy to find out the solution for an inexperience internee like me. But I do believe that the suggestions mentioned below will obviously increase the efficiency of Mercantile Bank Limited. There is no question about the returns to scale for the banks that developed their financial products and built the delivery system on a global scale. The Bank whose network system is strong enjoys a cost and competitive advantage over the financial institutions. In the electronic world the nature of competition is different and efficient bank can get a benefit from being and innovator, which sticks with a bank for a long time. Mercantile Bank Limited as a new Bank hasn’t yet setup proper network system. It is really very important of present time. At present all the branches of MBL can’t share online banking at the same time. Now MBL is thinking to implement software where a client can deposit, withdraw, get loan by only one account. This should be implementing as early as possible to meet the challenge of 21st century. AD stands for Authorized Dealer. Bangladesh Bank provides Authorized Dealership to the commercial banks. Some branches of MBL has got AD license but Green Road Branch is yet to get this. Green Road Branch is providing the service of AD to its honorable customers via other branches (Kawran Bazar, Dhanmondi) which kill the valuable time of its customers. For this reason Green Road Branch is losing its expected customers. To capture those customers MBL should take necessary steps to have an AD license for Green Road Branch. MBL has committed to their prospective customers to payment of cheque within 30 seconds after submission but unfortunately they are not able to payment of that cheque. I think the bank should try to keep its commitment hearty or it should be remove form the characteristics of MBL. Otherwise the customers can think that the bank has no uniformity between its word and action. MBL Green Road Branch is now doing well in credit management especially in Micro Credit Division. Moreover the bank may face problem if it does not take some necessary steps to correct the flows that are identified. For increased effectiveness of various activities of MBL-the bank should not sanction any loan to those clients / customers, whose necessary information is not fully disclosed to the bank. To get information, which is needed for credit appraisal, the bank should not only depend on the client but also should try to explore the other sources of information for its authentication. They must rationalize portion of loans and advances to different sector for risk diversification. The bank also should go for long-term investment, which will diversify the risk. Credit worthiness analysis reflects the degree of credit worthiness of individual borrower which measures the risk of repayment involved with the borrower. Regression analysis for credit worthiness determination is not still in practice in any banking sector. All the banking sector in Bangladesh use LRA in lending risk determination but they do this only as formality. They sanction loan based on interview and the reputation of the borrower and after sanctioning loan they do LRA as formality. So I think as they don’t follow LRA strictly and only as formality, mainly based on interview and reputation, they should apply some statistical tools such as regression analysis. For a long time, MBL have been carrying the burden of huge amount of classified loans. I hope that, MBL will minimize the dangers regarding the bad loans and advances through implementing the credit worthiness analysis. Obviously, this is not the ready prescription on all ills but it would be helpful to the MBL to go one step forward of their mission to minimize lending risk.